In the July 2017 CAST, there were several articles about Florida Tarpon fishing. Here are some videos from Steve and Lorrin's trip. Lorrin - This tarpon was estimated to be slightly over 100 pounds. We attempted to land this for the University of Massachusetts. The landing was not successful since we lost it in the pilings of the 7-mile bridge. We had it on the rod for about 21 minutes. This first link (first 2 minutes) is from Steve's point of view since he was shooting video from the back of the boat. 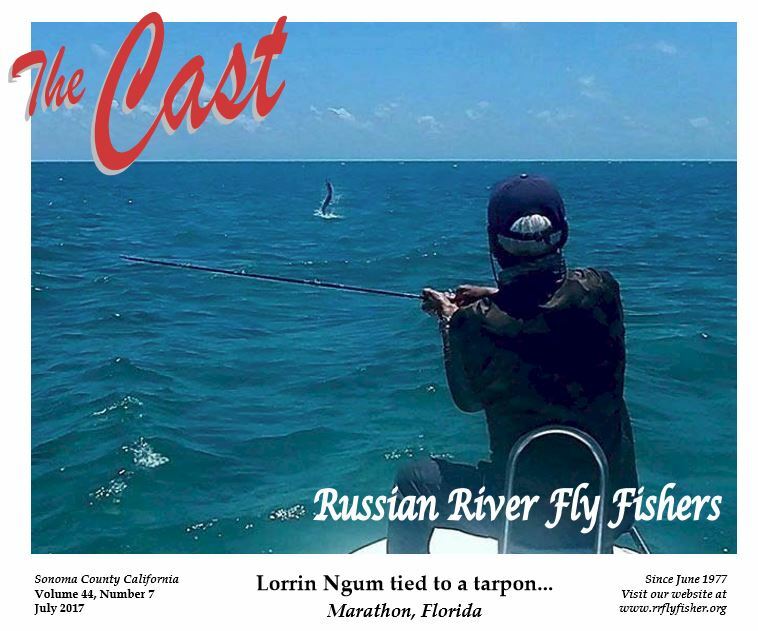 Lorrin - This link (full 21 minute video) is the same action, but from my perspective on the casting deck, shot from my GO PRO mounted on my chest. Lorrin - Steve has a Tarpon we were attempting to land into a sling for the University of Massachusetts. Watch what happens in the first 10 seconds when the Tarpon almost takes the fishing gear. The University of Massachusetts received a grant from a private donor to conduct Tarpon research. Sensors are already in place on the ocean bottom of the Atlantic Ocean and the Gulf. The objective is to surgically insert an audio acoustic tag into the Tarpon, stitch the Tarpon up and release it. The angler names the Tarpon and provides the scientists an email address so you get updated information on the Tarpon for the next five years. Kinda' cool. Albert is the best guide in Marathon, Florida Keys, and you will see his boat handling capabilities and how he respects/protects the Tarpon when the bull shark appears and begins taking swipes at the Tarpon. His boating skills are evident as he keeps the line from hitting the prop as well as doing gyrations to scare the shark away. Although we sling landed the fish, the scientists contacted us about 20 minutes later advising the fish spent all its energy and would not have survived the procedure. The fish was revived and successfully released. Steve would have been able to name the fish if the surgical implant procedure had been performed and he would have received monthly emails for the next 5 years updating the whereabouts of this tarpon. Lorrin - This video of my first tarpon landed in two parts. Video length 30 minutes. Note the school of tarpon at the 12 o'clock position (straight ahead of the boat). You'll also see a large splash after a few casting attempts at the school, which is when the school split up. ​Albert (the guide) elected to go after the school which was at about 11 o'clock and you can see the learning curve escalate. My right forearm muscles were pretty much gone within about 15 minutes and it was agonizing applying pressure on each of the runs. Ouch! LINK to video 5 - Lorrin's first Tarpon landed, est 85 lbs, hookup at about 4 minutes, 21 minutes total. Link to video 6 - Lorrin's first Tarpon landed, 9 minutes.